“I come to see famous hackerspace,” he says. At which, of course, I get giddily excited and explain that’s just what I came to ShenZhen to find. If you haven’t heard the word hackerspace before, here’s the deal: A hackerspace is a shared place for creators of software or whatever else, to get together, figure our problems together, and celebrate their creations. Hacking, to people who call themselves hackers, is exploring what new, beautiful things you can push a tool do. Whether it’s making laser-burnt art panels, 3d printing a mathematical equation into a real-world art object, or getting a piece of software to do something its creators never imagined, that’s all hacking. So yeah, I went to meet with Chinese hackers. Not the kind that you hear about on the 6 O’clock news. The other kind. It turns out, I’m crashing across the street from one of China’s most famous hackerspaces: Chaihuo Makespace. Actually, it’s ShenZhen’s ONLY hackerspace. I find this shocking, but each person I ask, incredulously, agrees: This is ShenZhen’s only semi-public space to swap hacks. The city is a solid brick of electronics manufacturing and related industries, and you can find more mills and lasers and circuit printers than anywhere else in the world, maybe. But it’s all in private hands. If you want to go someplace, borrow a 3D printer for a couple hours and just get down to some serious making, Chaihuo is it. 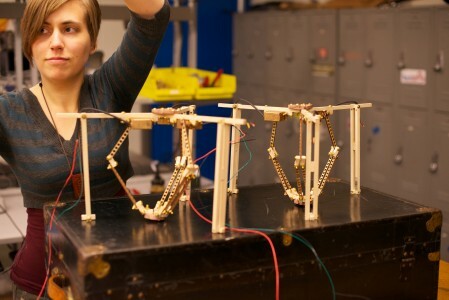 We play around during a demo of a new project from SeeedStudios: The “Grove” series of electronic building blocks. These are little circuit bits a child could plug together to make simple machines and concepts: lego for circuits. 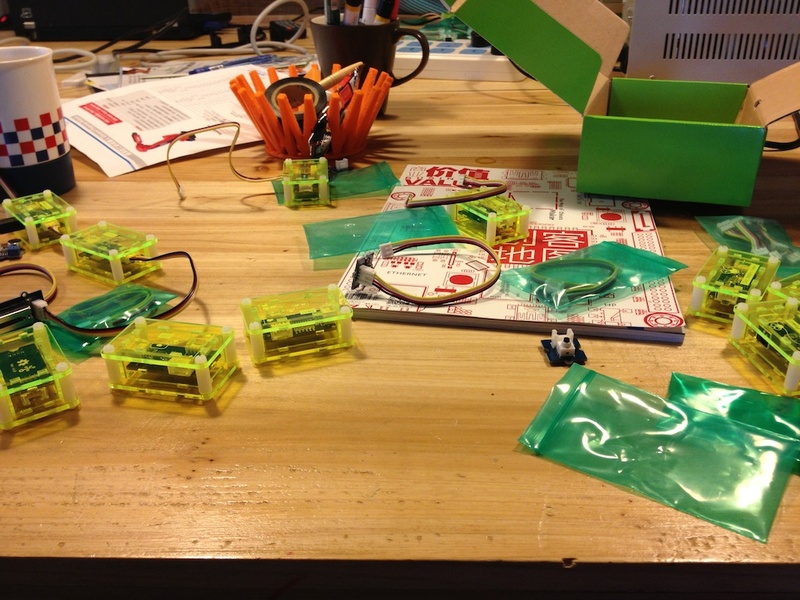 It fits somewhere between the “littleBits” line of toys, and getting kids to start plugging sensors and motors into an Arduino microcontroller and home brewing their own robot. Afterwards we talk more. I learn that there are two start-ups operating out of Chaihuo (which is about the size of a studio apartment). Chaihuo is also frequented by the SeeedStudios crew, and Hao. Hao built DoraBot, a motorized wheelchair with a computer and a screen where the person would sit. It doesn’t click right then, but I’ve seen DoraBot back in San Francisco, in our hackerspace, “Noisebridge”. And of course, he’s already friends with Alex. At any hackerspace, anywhere in the world, someone is already friends with Alex Glow. 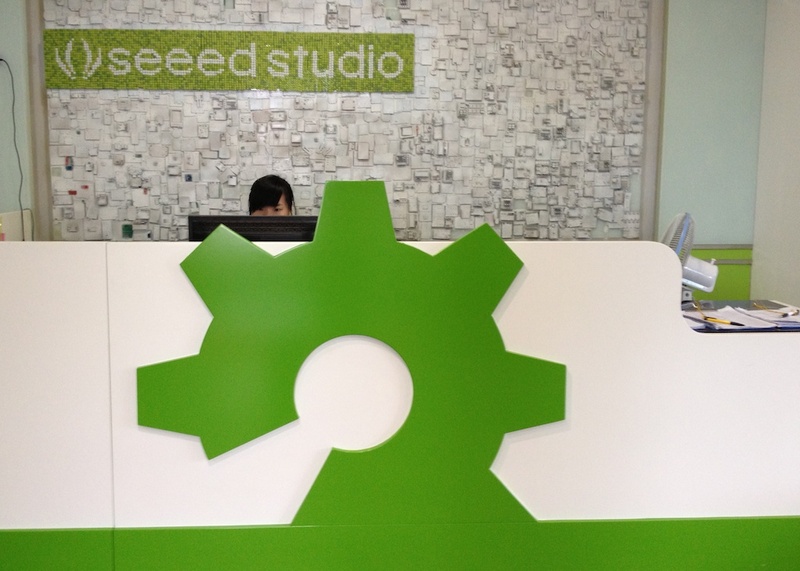 We also meet Kevin Lau, one of the founders of Seeed Studios. He invites us to come for a tour the next day. Naturally, we accept. Seeed is pretty neat. We get the nickel tour, from the backdrop behind the greater’s desk made of old circuit boards, through R&D, down to the floor below for actual circuit building and “JaiYou!” contracts. “JaiYou!” is the local, untranslatable word of effort. It’s something you shout at athletes to encourage them to push harder. You might say it to a friend, as praise for accomplishments. And if you get a job that you want to knock out in a day to impress the client, that’s a “JiaYou” job. SeeedStudios has one floor for JiaYou. The closest you can get to a literal translation of “JiaYou!” is “Step on the gas!” But JaiYou gets said for every kind of circumstance of encouragement. Those youtube time-lapse videos of Chinese skyscrapers going up in 15 days of round-the-clock work? A tribute to “JiaYou!” Effort, speed, and results for their own sake. Another note that comes up in conversation with both Hao and Kevin is their awareness of China’s reputation for copying, not creation. “Shanzhai” is the word for it in Mandarin. “Shanzhai” is the culture of reverse engineering and copying. This could be an homage to the original. More often in the modern world, it’s to recreate the original with cheaper parts and sell it for less. They joke about ShanZhai. And they look down on it. They both want to be creators, not imitators. Kevin points out how SeeedStudios’ circuitboards now have the inscription “Innovate with China” printed on them. “Like a response to Apple’s marking their products, ‘Designed in California, Made in China’ on the box?” Kevin nods. After that, we head into HuaChiangBei. This is the legendary core of Shenzhen’s electronics industry. 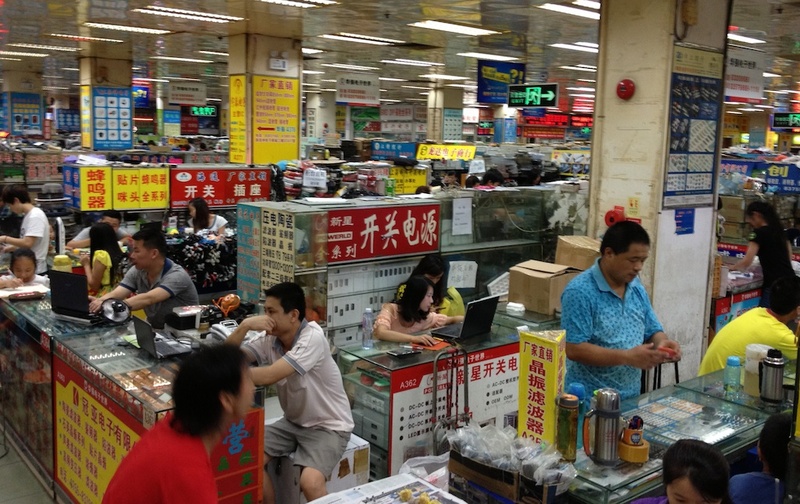 If Akihabara, in Tokyo, was the world hub of electronics in the ’80s and ’90s, HuaQiangBei in Shenzhen is the place today. Take 3 city blocks wide, east to west, and 5 blocks tall, north to south, and pack it with multi-story malls. Set up each of these malls as an open floor, packed cheek-to-jowl with 5 by 5 stalls, each one holding one or two exhausted salespeople, and one kind of product. Each stall is packed in solid. Most don’t even make room for an entry gate: You slide a the blocks of the counter out of the way to get in or out. Customers stand in the aisles between stalls. At noon, half the merchants are head-down on their counters, taking a siesta from the monsoon heat, or slurping down a lunch of noodles. Blessedly, no one’s going for the hard sell. The hundreds of merchants you pass are content to let you go on your way, knowing that you’ll stop with questions if you have any. No one has the energy to be a hawker in the swelling heat of the season. And their products are individually obscure: Why should any merchant expect you need a hundred or ten-thousand power switches? With each merchant’s laser-tight specialization, the benefit of flagging down random passers-by just isn’t there. When someone needs to pour over 30 different power switches to find the one that’s just right for them, they’ll come to you. The same goes for the guy with 50 different makes of button to your right, and the guy past him who has 20 different power rectifiers to choose from. “TV Sticks” – these palm-sized cartridges plug stright into a TV’s HDMI port. Plug in a mouse and a keyboard and you’ve got a basic computer for 50$. 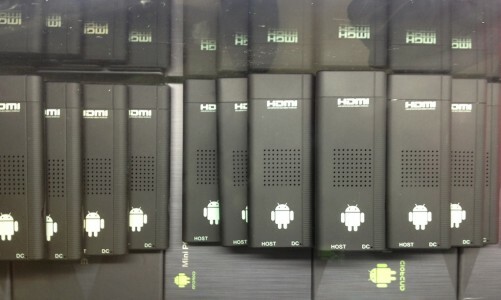 It’s the same guts as your android cell phone, but using a computer’s I/O scheme. Actually, this merchant isn’t selling full TV-Sticks. They’re selling a housing. The same way most of the other merchants in HuaQiangBei are selling just one component, this guy is selling generic housings, for anyone who wants to make one of these bargain-basement computers. Shenzhen, you’re a place I need to see more of. But first I want some serious tourist time, to sit down with an iced coffee and an unfinished manuscript. Let’s head north, and take the slow train back, with lots of stops along the way.